Apr.1, 2014 | Wall Street just can't help themselves. Elite traders, not satisfied with the deluge of dollars they already were taking in on behalf of hedge funds, are screwing rank-and-file workers by using high-speed networks to find out what stocks others are buying and then buying them first. This rigging of the system – perfectly legal under current rules – allows them within milliseconds to buy and then sell shares and take in tiny profits, over and over again…Government cannot expect hard-working Americans to buy into a system that is crooked. Full story at teamsters.org. Apr. 7, 2014 | ...A union is you. It is me. It is the ideology that we have a voice; that we all have the right to due process. A union is the ability to say, “I am a human being and I have certain inevitable rights as an American.” It is a feeling of self-respect and the knowledge that I am my brother’s keeper. A union is the logic that we have responsibilities to help the less fortunate among us. It is a passion that drives us to do the right thing so our world will be a better place... Read the entire guest column at thegazette.com (Iowa). Apr. 7, 2014 | Last Friday a district court judge approved the million-dollar settlement that Baltimore City school bus drivers and attendants reached with their employer, Durham School Services. The settlement covers damages for 372 class members over unpaid wages dating back to 2010. “Teamsters are proud to have helped these workers bring this injustice to light. We will continue to stand with them until all wages they have earned and are owed are covered,” said Sean Cedenio, principal officer of Teamsters Local 570. A third-party administrator will calculate and issue checks to be mailed to Durham drivers and attendants within 60 days. Read more here. Apr. 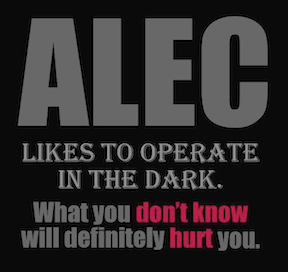 8, 2014 | (click image to view) Our union provides information and talking points about ALEC, the secretive organization that wants to make us poorer. “In every state, the corporate-sponsored American Legislative Exchange Council, ALEC, works behind the screens to pass laws that empower billionaires and corporations. ALEC pushes laws to strip workers of their rights, eradicate public education, outsource everything that can’t be nailed down, weaken environmental and consumer protections, suppress voting and increase taxes on the poor and working class while slashing them for the wealthy and for large corporations.” How does ALEC work? Learn more at teamsters/war on workers.org. Apr. 17, 2014 | Our endangered Teamster brothers and sisters who drive horse-carriages in New York City are winning support from some powerful friends, including the New York Times editorial board, actor Liam Neeson and the New York Daily News. They are defending some 300 horse-carriage drivers from animal rights extremists and Mayor Bill de Blasio, who want to ban horse-carriages and throw the drivers out of work. Full story at teamsternation.org. Apr. 23, 2014 | Post-Great Recession America may not be a place of double-digit unemployment. But the number of jobs where workers can earn an honest living that supports a family with the basics has shrunk substantially. And much of that is due to big business hiring tricks that have created an underclass of temporary employees. Increasingly, corporate America is filling its coffers by contracting with staffing agencies that bring in workers that do the same jobs as their permanent colleagues, but for a fraction of the cost. Continue reading at teamster.org. Apr. 25, 2014 | Local 570 representatives distributed information to union and non-union workers at the US Foods facility in Severn, Md., yesterday as part of the national union's effort to raise awareness of the coming merger of SYSCO and US Foods. Read more at Local News. Pictured: Local 570 President Ray Valentine passed out fliers and spoke with workers as they arrived at the US Foods facility.